Cellulose fibre ceiling insulation for a lifetime of comfort and energy cost saving. Servicing the greater Cape Town area. 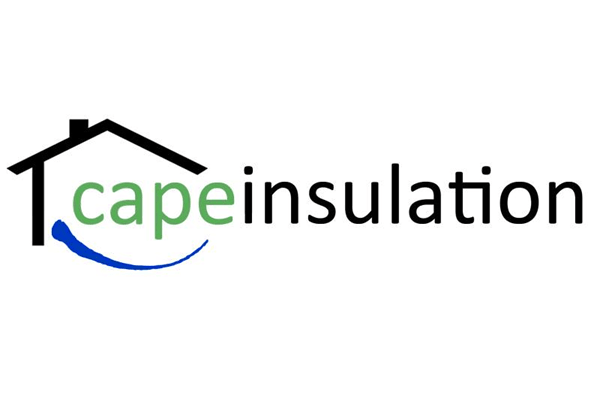 Cape Insulation only installs Cellulose Fibre made from recycled paper and milled with an inorganic fire retardant and rodent repellent. This creates a naturel insulation material that is safe and effective. A well-insulated home you will save on electricity, gas or wood consumption. 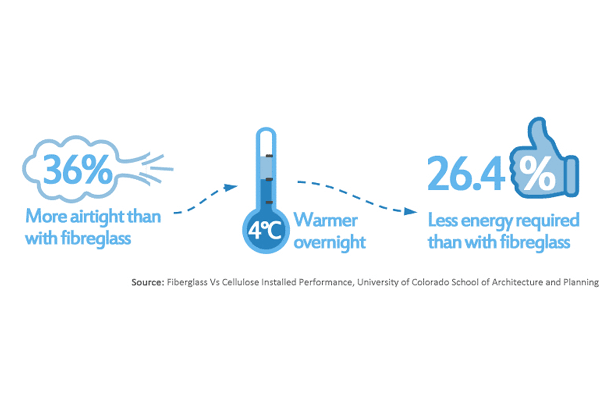 The cellulose fibre layer will keep up to 89% of the heat generated in your roof out of your house, resulting in your home having a more temperate feel. The more extreme the weather conditions, the more effective the insulation. The damp, cold air is kept out of your home and any heat is retained, making your home naturally cosier. 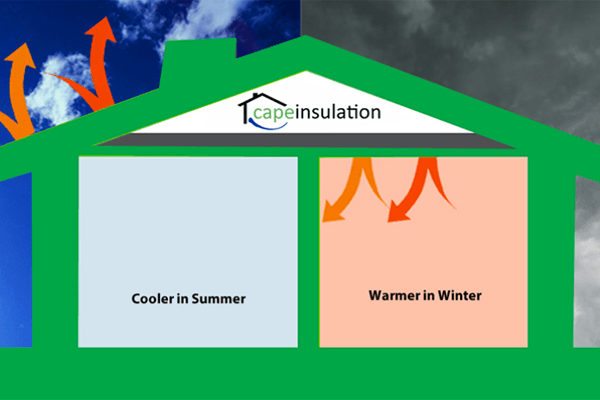 Insulating your home is a once off investment in natural home comfort and energy savings. 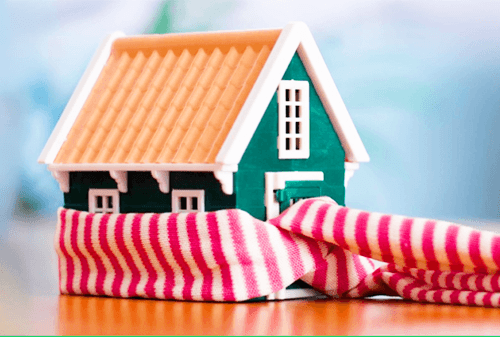 A well-insulated home will require substantially less energy to heat or cool your home. The lifetime of energy cost savings, far out way the initial investment in insulation installation. will The cost savings will pay for the insulation and you continue getting a life time of saving energy. Cellulose Fibre is an excellent acoustic insulation. It is three times (3X) denser then fibreglass and absorbs more sound. This is great for metal roofs, wooden floors and noisy rooms. Cellulose Fibre is tested by the SABS and fire rated B/B1/B. It does not support flame spread. It has proven that it is better to have Cellulose Fibre Insulation if you do have a fire. It will slow a fire down, may contain it too a smaller area and may even help put it out. It is used in wooden homes all across America. The same fire retardant dries out the skin of rodents and insects and they cannot nest in it. We have successfully used Cellulose to keep homes rodent free. The Cellulose is completely non-allergenic. It is just recycled paper and the fire retardant is like an inorganic salt. It is also used in medicine. The Cellulose is also trapped in the roof space. Cellulose Fibre has a life time guarantee as long as the building and roof stay intact. It may compress slightly but will still keep the stated R-value due to the density. We only install Cellulose Fibre as it has been proven to be the most economical, eco-friendly and effective insulation medium for your home. The combination of recycled paper and the aerated installation method creates an excellent snug fitting insulating layer. The result is a more ambient temperature throughout the year as well as saving you electricity, gas or wood consumption. Real live tests on identical buildings found Cellulose was 36% more airtight and saved 26.4% more energy than fibreglass or blanket type insulation, and kept the building 4 degrees warmer during colder months.